Let’s face it. Life can be complicated and messy, no matter where you live. But when moving overseas, folks face even more challenges. Whether it’s something as simple as not flushing toilet tissue in the developing world or something as difficult as learning to live comfortably with less or without first world conveniences and products, the adjustments may be many. But, the fact of the matter is, interior design can become expensive and overwhelming for anyone, anywhere. Still, some of us encounter home-making and decorating complications because we move abroad with only our cat and six suitcases or because we’re waiting for a shipping container to arrive from North America or Europe. In either case, we’re forced to adapt and make do. We’re forced, not only think outside of, but in some cases literally live without the twenty-foot, steel box steaming toward Ecuador, India, or Indonesia. So, hoping to help you manage issues that can challenge domestic bliss no matter where you live, I bring you 10 fun decorating ideas you might not have considered—design alternatives that are easy, inexpensive, and, in some instances, free. Hang on and enjoy. I’m saving the best for last. Here’s where thinking outside the box becomes literal, as Sara and I incorporate wooden ones into our decorating in ways you might not have thought of. Sure Sara has used a box to elevate her computer monitor, but it’s even more interesting to turn one on its side and use it as a shelf. Since we had floor coverings coming in our container but wanted something in our patio seating area in the meantime, we had to think creatively when it came to rugs. It just so happened that here in Ecuador, where we live, indigenous folks use woven mats as mattress pads, of sorts, placing them between their mattresses and bed frames to create extra warmth. 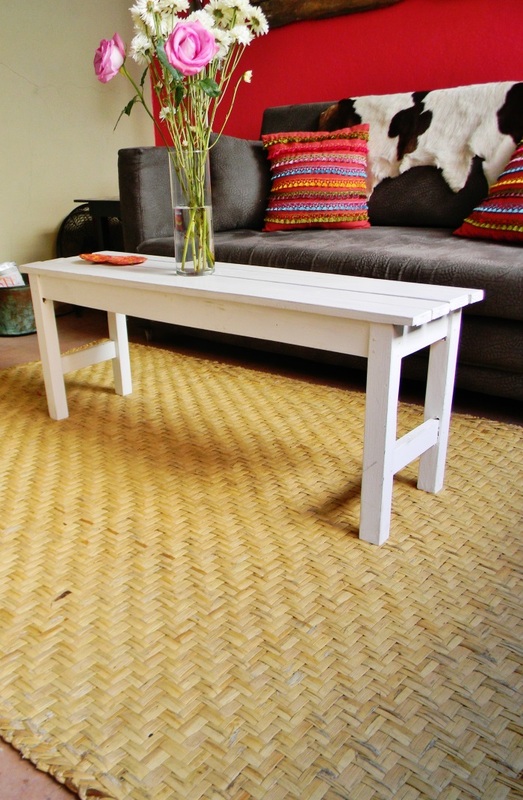 When we saw them sold for merely $15 at the local market, we knew we’d discovered the rug we’d been loving for. What do you think? In the photos above, you may have noticed that we converted a raw wooden bench into a coffee table for our patio, by painting it white. 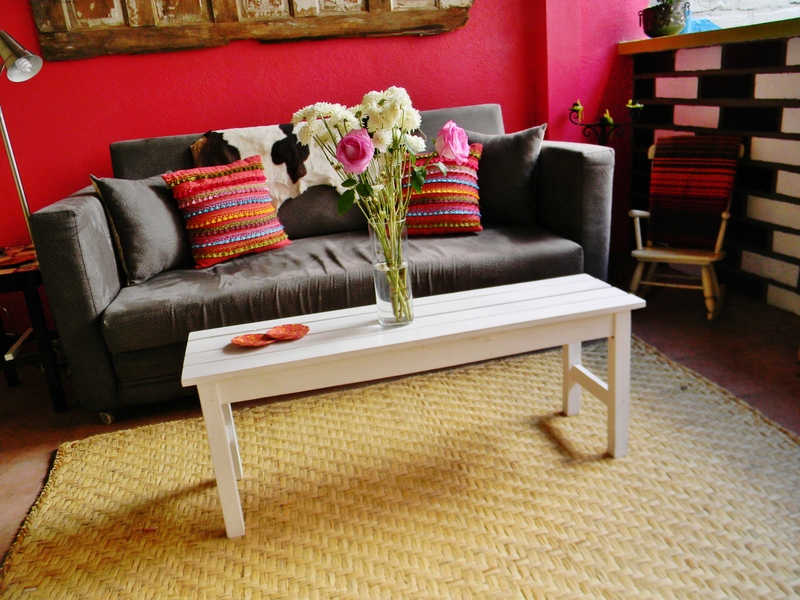 But at the same market where we purchased the bench, we discovered a coffee table option for our living room , as well. In Ecuador, some folks use iron grills for outdoor cooking. These, we realized, could, not only be purchased for less than $20, but could also have a glass top added and be transformed into a conversation piece in our living room. For one of our guest rooms, here in Cuenca, we built a bed from left-over lumber but didn’t have a headboard for either it or the bed in another room. 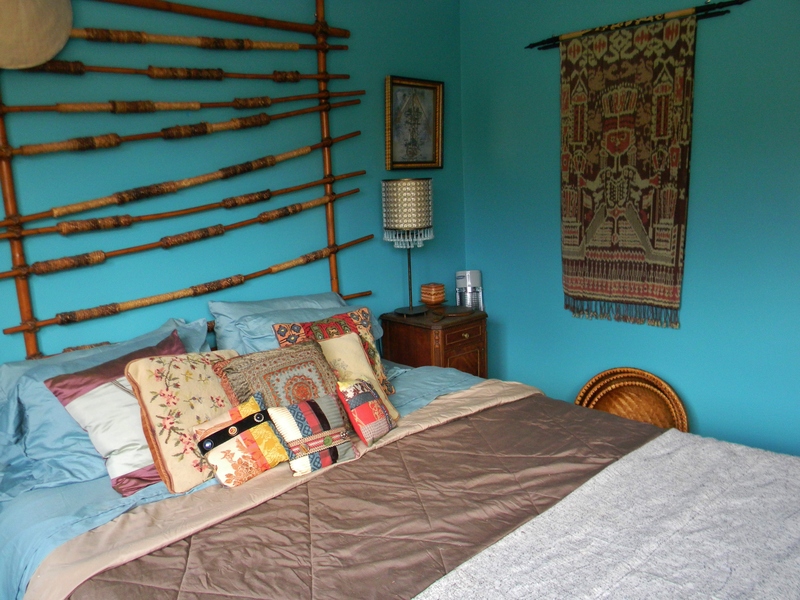 In the first instance, we used a wall-hanging constructed from African spear handles and attached it to the wall to serve as a make-shift but awesome headboard. 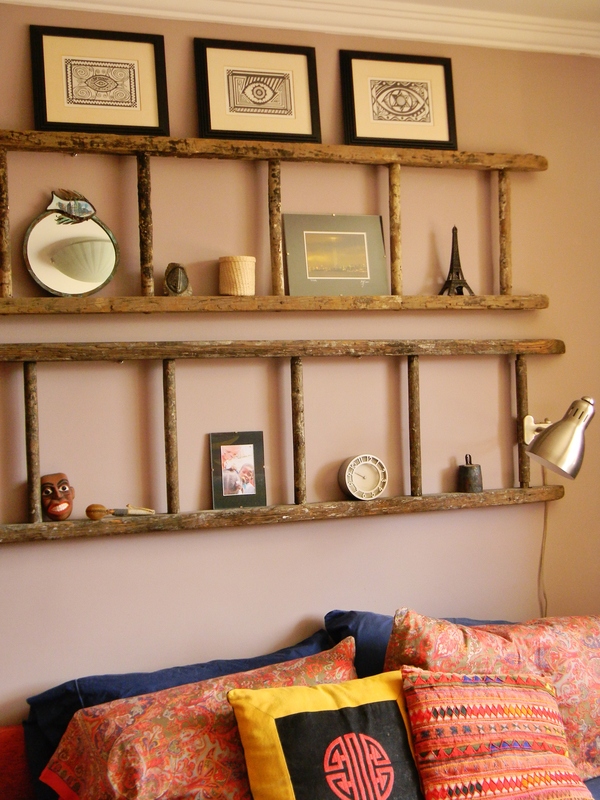 In the second case, we used wooden ladders, turned them sideways, and hung them on the wall above the bed—instant shelving and headboard in one. In those same bedrooms we needed curtains. However, we couldn’t find ones we liked and didn’t want to invest in custom-made curtains or rods made for what was only a rental property. 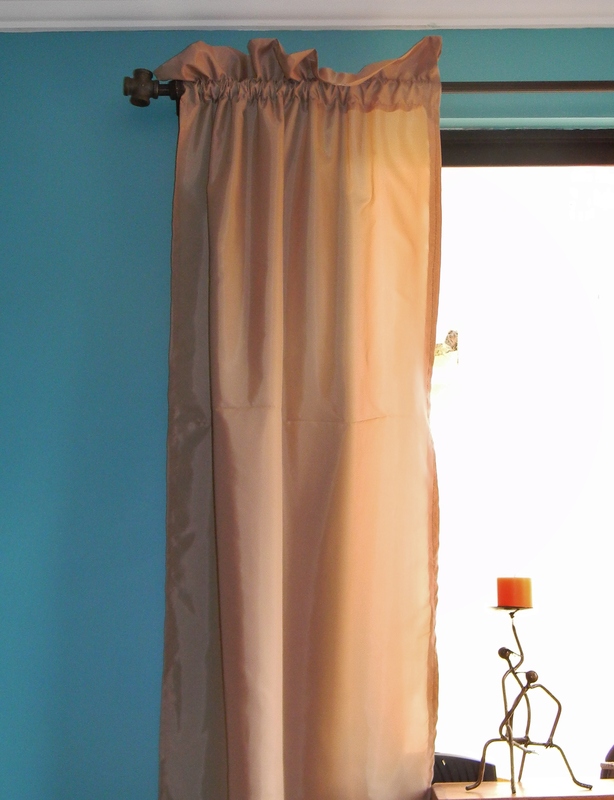 So, I improvised, sewing curtains out of old sheets and making rods from plumbing parts I bought for pennies a piece at our local version of Walmart, a place called Coral. What do you think? However, Sara’s office also needed a decorating intervention. 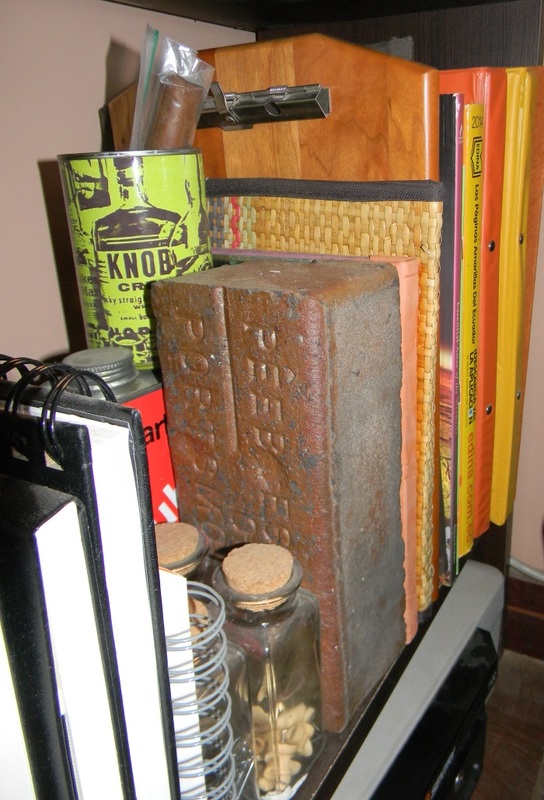 So she used bricks for bookends. 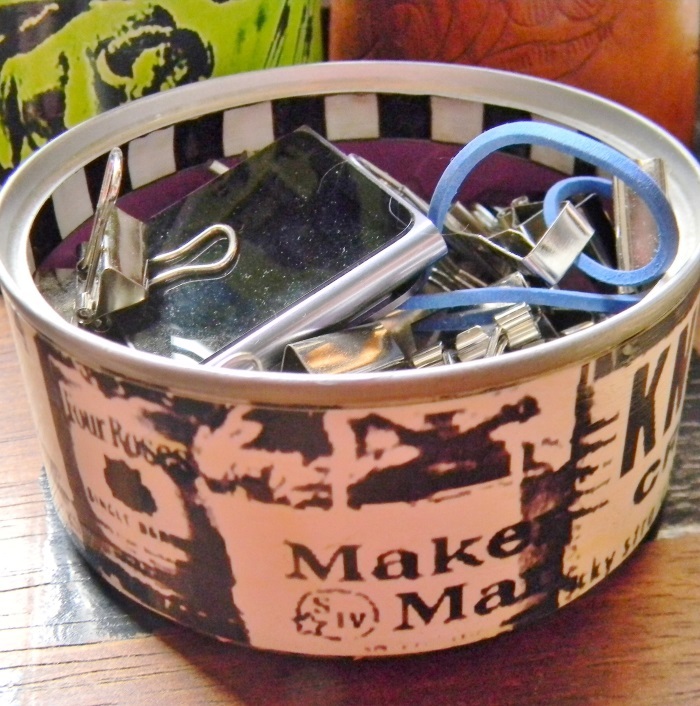 And she converted tin cans into desk accessories by removing the labels and gluing photos she’d taken of bourbon bottles in their place. 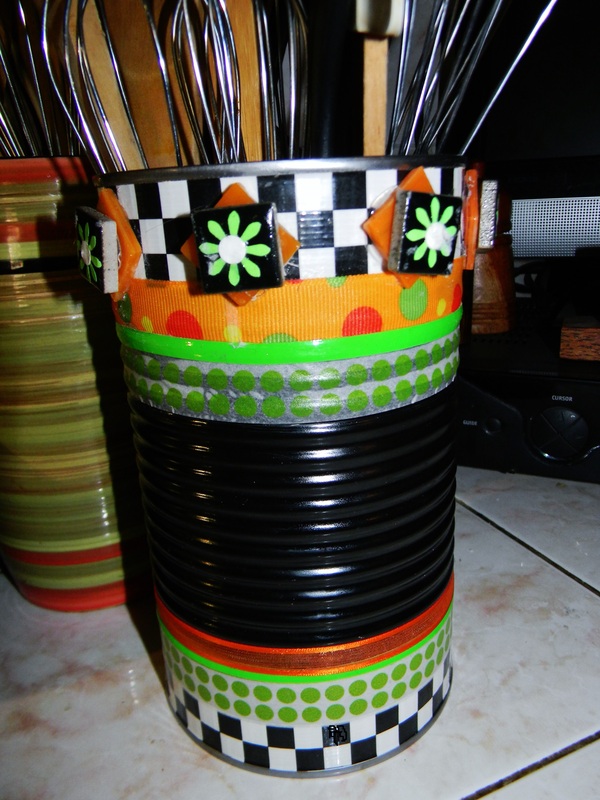 I transformed cans into perfect utensil holders for our kitchen counter, using paint, duct tape, ribbon, and pieces of ceramic tile. It just so happened that we needed picture frames, as well. And, again, we couldn’t fine the ones we liked. 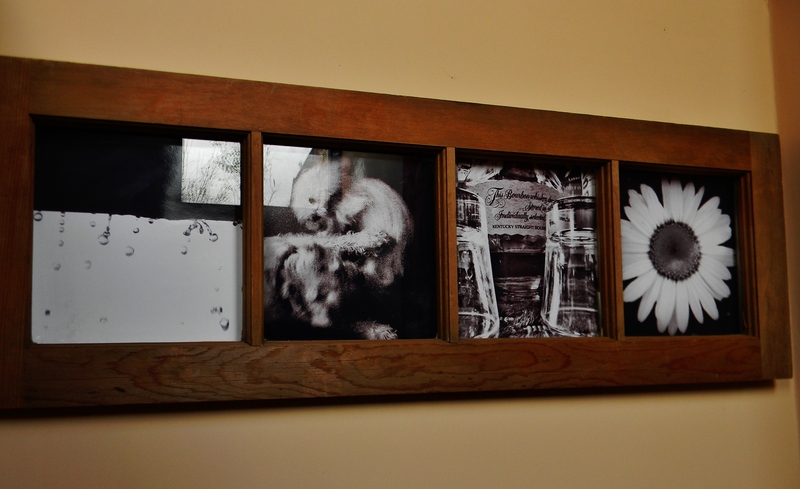 So we converted window frames into just the perfect frames for pictures and art. In the house we now call home, we also needed oversized wall hangings in a stairway whose ceilings were twenty-feet tall. So, I decided to covert the ethnic Afghan dress Sara had been gifted in the north of that country into just the right-sized art. This could also be done in Latin America with beautifully woven ponchos or blankets, in a place like India with saris, or in Japan with kimonos. Any item of ethnic clothing will do. But we, also, hung a round table top I’d painted on the wall as art. Living overseas has taught me alternative uses for baskets, as well. They’re plentiful, inexpensive, and add an organic dimension to any room. 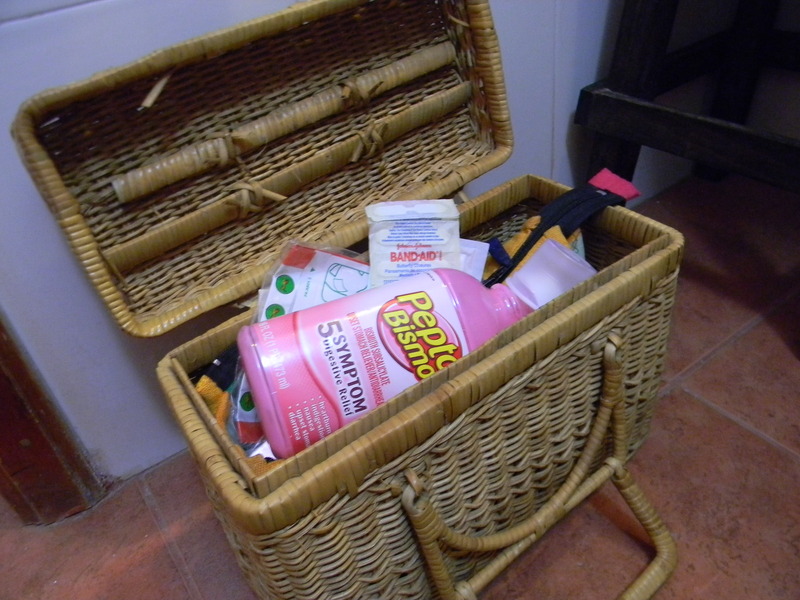 Since, we’ve been forces to survive without a medicine cabinet in our Cuenca home, for example, we’ve converted a basket into a first aid kit. And on another wall in that same bathroom, we placed a basket on a shelf, leaned its bottom against the wall, and used it as art. 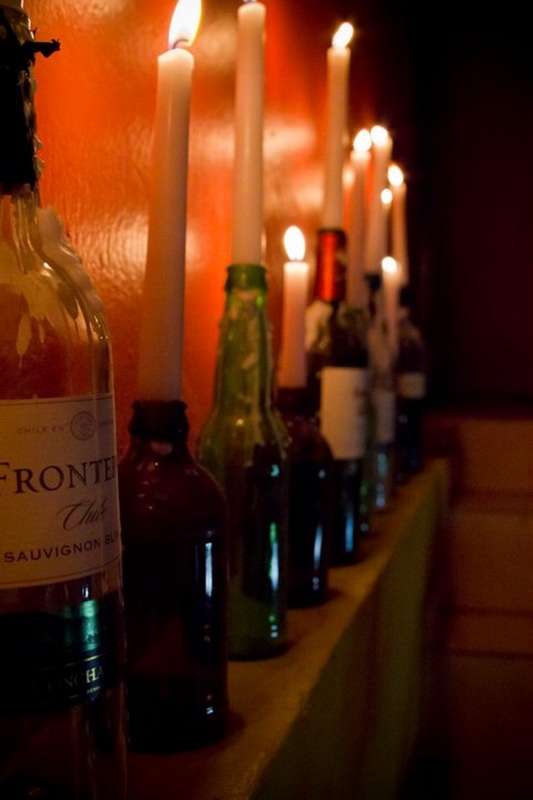 —that bottles make amazing candle holders. In Port-au-Prince I used wine bottles, but here in Ecuador I’ve found beer bottles to be equally useful, especially the local Pilsner versions, some varieties of which are brilliant blue or green. 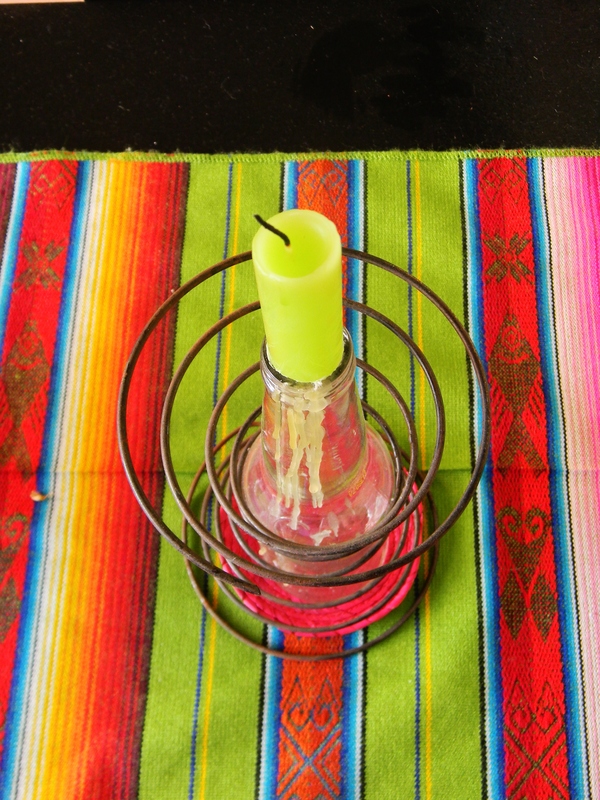 This candle holder also incorporates an old sofa spring. So what do you think? In what ways have you learned to adapt when it comes to decorating your home? Have you discovered any affordable and creative alternatives to traditional design elements? What is your biggest decorating success or failure? 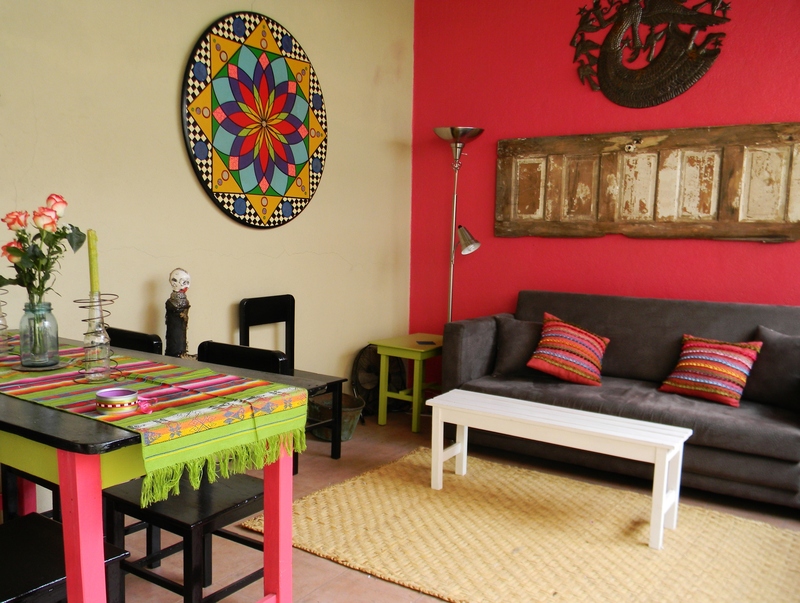 This entry was posted in Ecuador, home and tagged Cuenca, decorating, design, Ecuador, expat living, expats, home, interior decorating, interiors, LGBT, life, style, top 10. Bookmark the permalink. Thank you. I’m so happy you like those ideas. And the candle holders were free. I recycled the springs from an old couch of mine and the bottle were once in our frig. Great to hear from you today. Hope your week is going well! Thanks so much for sharing my post! can you trow more light on what you do,and area of intrest i can fixed in? Thanks for your comment. So great to hear from you! Love it all, my favorite are the ladder shelves. You didn’t mention the shutter over the sofa. And all that wine and beer drinking! Great photos! At my pop up vintage and antique shop on the weekends I use wooden slated extendable industrial scaffolding stretched between two old wooden six foot step ladders that are painted green, for shelving to display my presentations. Oh, my, I didn’t even think to mention the door hanging on the wall. Thank you so much for mentioning it. That’s what happens when you live with these things. You overlook your own ideas. They become so everyday. Great to hear from you this morning, my friend. LOVE your shelving idea. We use ladders, as well. Wowsza ~ you are so talented Kathy! I especially love the bedspring candle! So cool! Perhpas a book is in order to showcase your home and how you’ve used ordinary objects in unusual ways! 🙂 Great job! Thank you so much! I don’t know if I’m talented as much as my mind just works in an unusual way. But I’d love to think I might be. (blushing) I think those candle holders are my favorites, as well. I upcycled them from an old couch before I got rid of it. Hope your week is going well, my friend. Wonderful to hear from you! I surely can ~ like a beacon in the sky! Oh, Robin, I LOVE that you might borrow that ladder idea! Isn’t it fun? And SO, SO easy. I bet you have some old ladders you’ve discovered around your place. Actually, you also have some great bottles! What I wouldn’t do for some of those. LOL LOVE hearing from you this morning! Hope your week is going well. Well done! It is great to use our imagination instead of our pocket books, cash that is! You did use “pocketbooks” as art didn’t you? I am amazed that you have made yourselves so at home so quickly! So many people move and live with the chaos of boxes and stuff for way too long. You have created warm loving home ! Oh, dear Jeff, how wonderful to hear from you this morning. I know your mom is nearing her end, so I especially appreciate your taking the time. Hugs and love to you and your family. And I must confess, we lived with boxes for WAY too long. But finally they are all gone. Thank God. Thinking of you. Love and hugs! Your blog is always a breath of fresh air for me! I enjoy its colorful expressions in photo and humor. I took the time to get my second coffee and to sit so I could enjoy the moments with you! Thank you so much for you ((Hugs)) and support ! Thank you, Jeff. You’re a sweetie. And I hope we get to meet you one of these days soon! Let us know when you want to visit. Love and hugs, my friend! Really fabulous ideas, all of them, as usual, Kathy. 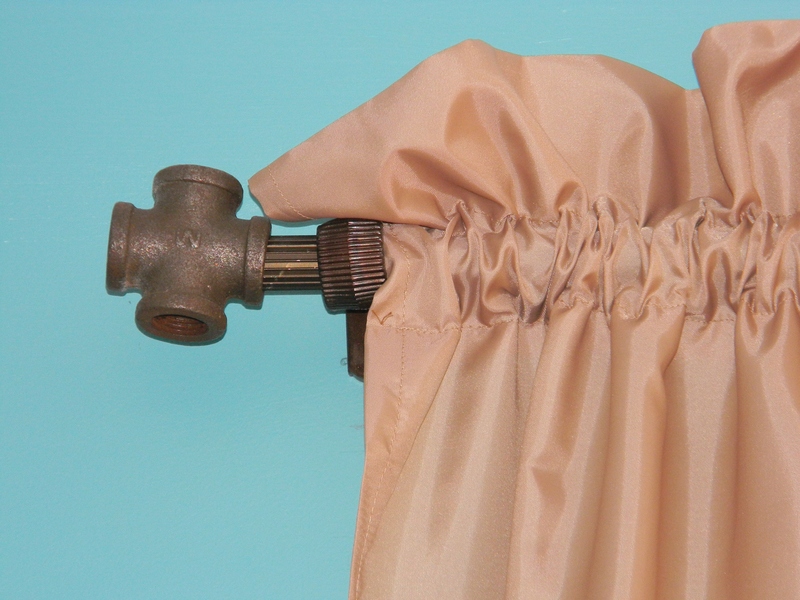 I love the curtain rods made from plumbing fixtures. Genius. Sharing because it need to be shared!!! Oh, I love you, Beth Ann! You are always so incredibly kind and generous. Thanks for sharing–really, really, thank you! And I am SO thrilled for you and your radio gig! HOW EXCITING! Oh you are welcome. I just keep looking at your photos thinking “why can’t I think of something like that?”. You are so clever and creative. But you’re clever and creative with your card making! Heck, you’re clever and creative, period! You are sweet. Thank you! Yes, I suppose we are rather crafty. Thank you, dear Tia. And I hope one day you will try one of these ideas. You know, it doesn’t take a lot of effort to stick a candle in a beer bottle? I’m cheering for you. I KNOW YOU CAN DO IT! Oh, and I SO loved your puppy memorial. It was so incredibly sweet, and then the suicide part cracked me up! Great post! There certainly isnt a shortage of beer bottles around here, but where did you get the wire around it? Thats what gave it its final WOW! That’s a spring from an old couch we were getting rid up. Any old couch you see someone putting out for the trash, should have some underneath. Just cut the thing open. Cheers to those bottles of yours!! Kathy I am amazed at your vision. I love all that you’ve done and wonder how many others see your art and wish you were their decorator. 🙂 it takes a beautiful mind to see beauty the way you see it. And where you see it….which is every where. Hugs to you both!!! Oh, Colleen, thank you so much. You are dear to us. You and David both are. I was incredibly thrilled to see your post Freshly Pressed the other day. It deserved it. Heck, you’ve deserved it for a long time! Hugs to both of you from both of us! The pleasure is mine, my friend! Idea’s or not, it’s really fun to have a photo tour of your home. I’ve done boxes as shelving, but I really like the ladder. Thank you, dear Lisa. You’re sweet. Fun to know that you’ve tried the box thing, but, yes, the ladder idea is fun and easy. Really easy. Great to hear from you this morning. Hope your week is going well, my friend. These rooms are brilliant. Really, super. 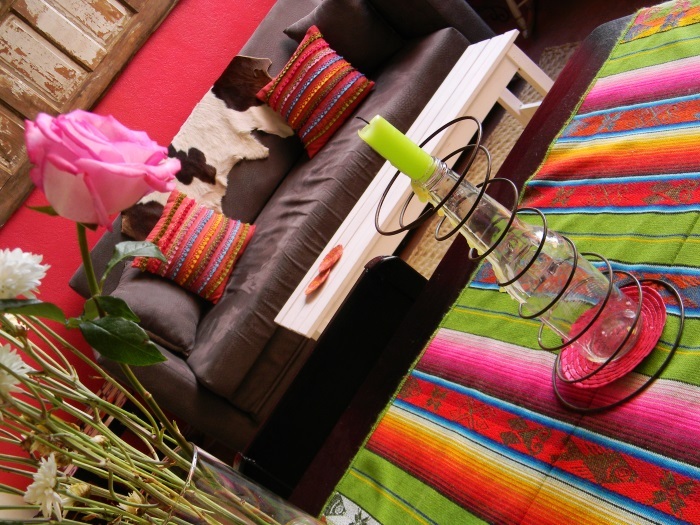 I lived in South America and had to be creative on a shoestring to decorate a six room apartment. It was doable because the local crafts were so colourful and inexpensive, but it was still a challenge. I love your ideas and I would guess a lot of people living right in their own countries could use these ideas at home, too. Great post. Thank you, Beth! I’m delighted to hear you enjoyed my ideas and understand, as well, both the challenges and joys of decorating on a shoestring in South America. Yes, you are right. I think living as an expat has helped me develop decorating ideas that can benefit anyone. Thanks SO much for stopping by! Great to hear from you! Lovely home, great pics! That bedspring candle is brilliant! Now, if I can just finish nattering with this slatted table…sigh! Oh, Dyanne, I’m so happy to hear from you this morning! And you can finish. I have COMPLETE confidence in you! TOTAL confidence in you! Thanks so much for stopping by and taking the time to leave a comment! You’re a genius Kathy, you truly are. I could find, buy, or steal all kinds of ladders, bottles, buckets and baskets, and never end up with anything that remotely looked like what you’ve created. It’s a true gift you have. But I also could imitate and replicate your ideas (and I’m not above doing that), so thanks. You’re an inspiration. Christine, you are such a dear! Thank you. I have NO idea why my mind works the way it does, but I hope folks will, indeed, borrow my ideas! GO for it, my friend. Wonderful to hear from you. Hope all is well in Cinci. I will be coming to Lexington 3 weeks from today for a week. I think many of these ideas are fabulous and usable in more situations than just being an expat – for example – if I had these in my brain when I went of to university – these would have helped change a common dorm room into a personal lair! Re-post to the younger set blogs! WOW, that’s a great idea! Hadn’t even thought of this being helpful to college students. Thanks for sharing that thought! I’m so happy to hear you enjoyed the post. Great to hear from you today. Please come by again soon!!! What do I think? I think you are genius, how is that? Your home is amazing, full of both of you in unique and gorgeous ways. Thank you for sharing another slice of yourselves. Why even bother to take your ‘stuff’ when you have such talent to make homes wherever you are. LOL You’re too funny, Val. I suppose you’re right. And we did just that in Haiti and Vietnam–made do and made up new ideas. I’m so happy you enjoyed seeing photos of our home again. You are dear, my friend. Thank you! Hugs and love to you, too! Kathryn, we have to talk! You have the beginning of an e- book here that you could easily sell on Kindle. Now, do you have places in Cuenca, besides the Rotary Market, where you scout for useful discards? Aha! Would LOVE to chat, Caro! Though ebooks don’t do well with photos. At least I have trouble on my kindle. I would think of this more as photo-heavy book, more images than anything–maybe coffee-table-book-ish. No, I have NO other place to shop so far. We need to find place to scavenge through trash. In the US, I LOVE to dumpster dive! Do you have any ideas? Also, I would like to know how you mounted the dress on the wall. I have an African dress in storage in Seattle I plan to bring back in the fall. Oh, hanging the clothing was easy. I just bought a length of hollow pipe at Coral, cut it to the right length and hung the entire thing on the wall with screws. Had to use anchors for the screws, but I can show you how to do it. Heck, I’ll bring my drill and hang it for you! Just pinned the sleeves in place, also. Thanks, Kathy. I’ll keep that in mind. I’m not doing my next suitcase run til October. Thank you, Bacon. You are such a sweet little pig! I’d be happy to lend a hand at Hotel Thompson, the next time I’m in Georgia. LOL Will let you know. Love and hugs to you, my dear! Sending lots of snorts your way! Love you, dear Bacon—-squealing back at you! Kathy, I love these ideas, and always enjoy a tour of your home. Every bit of it shows your creativity, thoughtful organization and spirit of fun! I’ve always used baskets and boxes and “things that will hold other things” in my space, as I’ve always had very small homes. At this time, I have a large trunk in use as a lamp table in the living room (while hiding wrapping papers, Christmas gifts, seasonal decorations and an ab-roller that I will probably never use). In my bedroom, I have three old suitcases stacked as a bedside table: two hold bed linens; the third has art supplies for visiting children. I hung a curtain over a storage area recently using two screw in porcelain things (used to guide electrical wires, I think) with a wooden dowel between them. Thanks for a cheery post! Thank you, Cindy. You’re a sweetie–always so kind and encouraging. Can’t tell you how much I look forward to your comments. And I LOVE all of your ideas. I need to sew a couple of curtains to hide a storage area, and I may have to give the dowel rod a try. Excellent thought. Thank you! Hope you are beginning to enjoy spring up there on your lovely island! 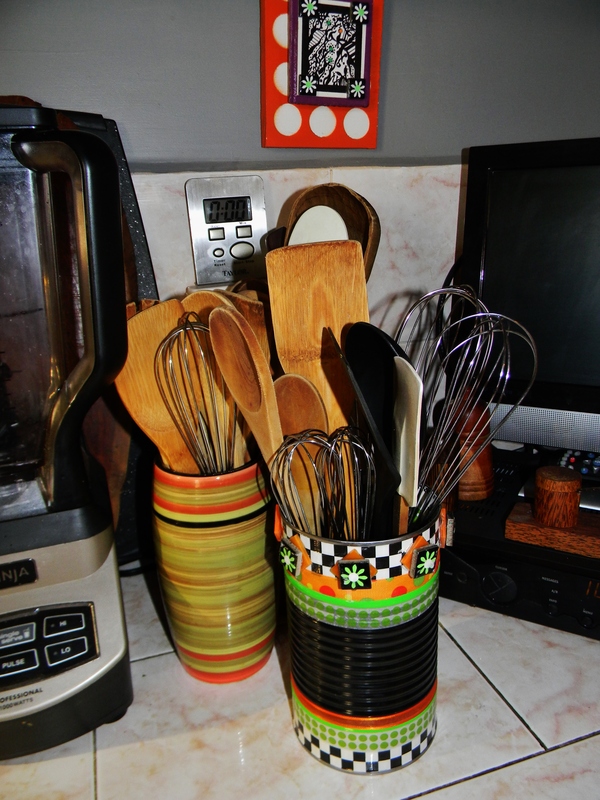 So happy to learn your thrifty, creative expressions in home decor and practical solutions. What a fun, colorful, inspiring post! Thank you so much, Michelle! Glad you enjoyed my ideas. Hope you all are well this week. LOVE hearing from you, my friend! Hope you had a lovely Mother’s Day, as well!!!! Kathy – clever, Clever, CLEVER! The wooden ladders, turned sideways is my absolute favorite! 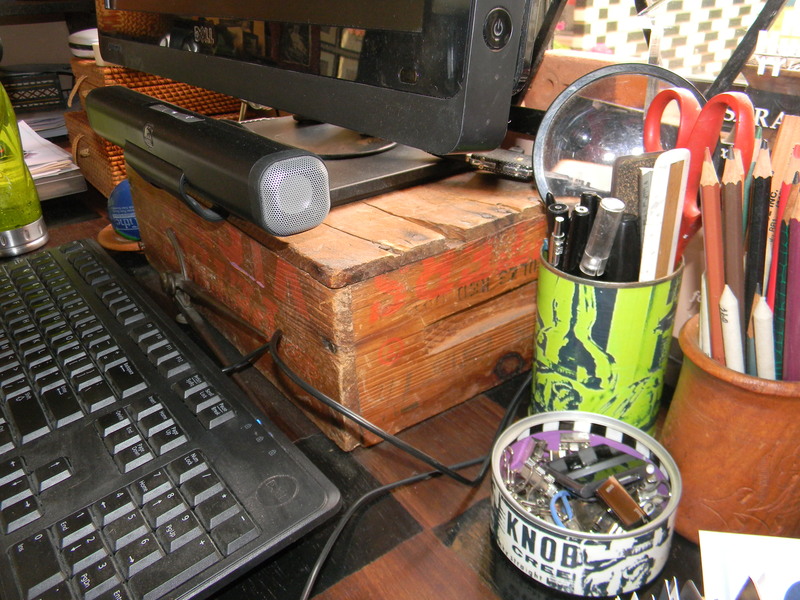 In my office I use a turn-of-the-century tool caddy to hold office supplies. In our bathroom I use a fishing tackle box to hold our first-aid supplies. Yes, yes, I have an old wooden tool caddy that holds art supplies. Just couldn’t include all of the ideas in one post. And I TOTALLY love the idea of using a tackle box as a first-aid kit. I may have to try something similar. Great to hear from you today, my friend. Thanks so much for your excellent ideas!! Goodness, you are SO welcome. Thanks for reading and taking the time to leave a comment. Hope you will, indeed, try the curtain rod idea. It’s easy and fun. Wonderful to hear from you this morning!!! Thank you so much. Glad you will give the ladder thing a try. I suspect you’ll enjoy the results. Great to hear from you!!! I loved all your creative ideas. The spears for a headboard idea is so striking. Your use of colors dazzles me and made me recognize how conservative I have become – gotta change that. I’m also a basket person but It was the mat for the rug and the ladders that are prompting me to do some local scrounging here. Thank you SO much, TiTi! Glad you, too, use baskets, but also found some of the other ideas helpful. You’d be surprised what folks in North America throw away. Some of my best finds have been in dumpsters, to be honest. Happy scrounging, my friend. Wonderful to hear from you this morning. Absolutely stunning! I want to live in this room! It’s colorful, whimsical… it has something magical or child-like to it. And it captures the spirit of Ecuador without being over the top. Very impressed with your ingenuity! Thank you SO much, Meghan! You have helped make my day. I hadn’t thought of our space as having a child-like whimsy, but I LOVE that description. Thank you for that! Also, just visited your blog. LOVED it and subscribed. Thanks for stopping by and please visit again soon! Thanks for sharing my post with your readers! Well, I sure appreciate it! Hope you are having a good week! Oh, thank you! You are such a sweetie. Glad you like the ladder shelving. I’m pretty fond of that myself. Great to hear from you today. Thanks for stopping by. Heading over to your blog now while I have a minute. Sorry it has taken me so long! I SO agree! 🙂 Have a great weekend. Damn…great ideas as usual. Love them all, particularly the boxes. Sadly, I don’t have any African spear handles lying around the house, otherwise I’d totally turn them into a headboard since Audrey doesn’t have one. As usual, your comment made me laugh out loud. I knew someone was bound to say something like that, and god knows it was bound to be YOU! How about ladders? Got any ladders? LOVE your comments, Mark. Thank you for my daily dose of humor! 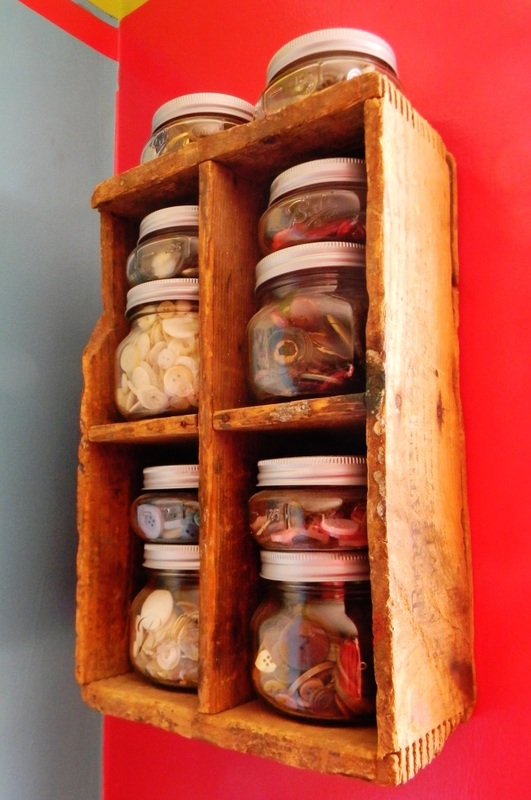 Loved the tour of your re-purposing decor! I have done alot of that in my life and am really going to miss not having garage sales and 2nd hand stores down there…I just used an old metal ladder for a big tall tomato plant, leaned it up against the shed I planted it near and now it can grow as tall as it wants! (plus I can climb up to get the tomatoes if needed…haha) I am curious about those wooden ladders, was that a dumpster dive or did you purchase them somewhere in Cuenca? They are gorgeous…and the Spears and the trunk, did you have a container shipped or were those found down there too? And as many have said, the couch coils, lol…LOVED that!!! I will have to get my re-purposing brain going when I move down too! I won’t be shipping a container (boy would I love to be able to, darn it! I have so many beloved items I have made that I am now selling off 😦 ) Great work, you girls did an amazing job! I hit a wrong button and lost my response to your comment. Thanks so much for enjoying our efforts to make do. But, goodness, your tomato plant stand improve is awesome. And, yes, you can climb to pick those babies. Pretty clever, my friend. Yes, we did bring a container. Sara wanted me to get rid of those ladders before we moved, but I refused. Now I think she’s glad. I’m going to the US for a week in early June, and I’m going to do some thrift storing and garage saling, for sure! Gonna be fun! Thanks for stopping by again. I love getting your comments, Sue! I was wondering if those items were found down there, had a feeling most likely not…haha, that would be me… I AM taking them… and hummm, there is a good reason to visit the states for me in the future! Friends I can see with skype, but garage sales and thrift stores, hummmm….!! 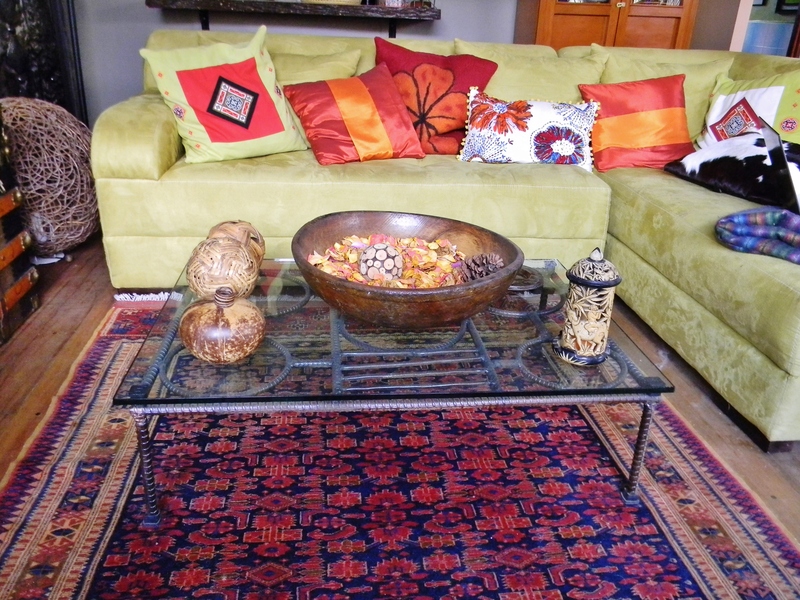 But some things I did get here–like the base for the coffee table and the rug and “candle holders”–to mention a few. Yes, will have to visit the US from time to time. Oh yea, I forgot to mention that large (old and fancy) table spoons worked great for hanging a lace shawl in one of my windows. Drill a hole in the spoon part (to screw into each side of the window) then bend the handle to make a hook (not my brilliant idea, saw it long ago on a blog somewhere..) and I just took the long ends of the shawl and looped them over the 2 spoons! Gosh, that’s a great idea. Spoons–would have never thought of it. LOVE it. And even if you didn’t think of it, you did it. I don’t know that I could drill holes in spoons. Can’t wait till you get here. We will have fun! I love this! So creative. I am not very creative when it comes to decorating, unfortunately. 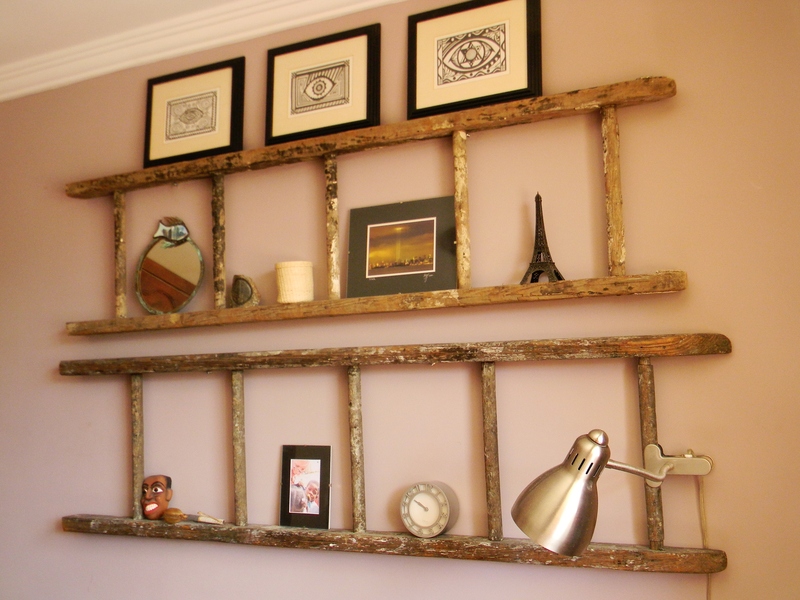 Or very handy with tools…lots of ideas though and one day I will get there! Thank you, Gertie. Great to hear from you today. I suppose, these things aren’t for everyone, but I bet you could manage sticking a candle in a bottle. LOL Hope your week is going well, my friend. Absolutely. 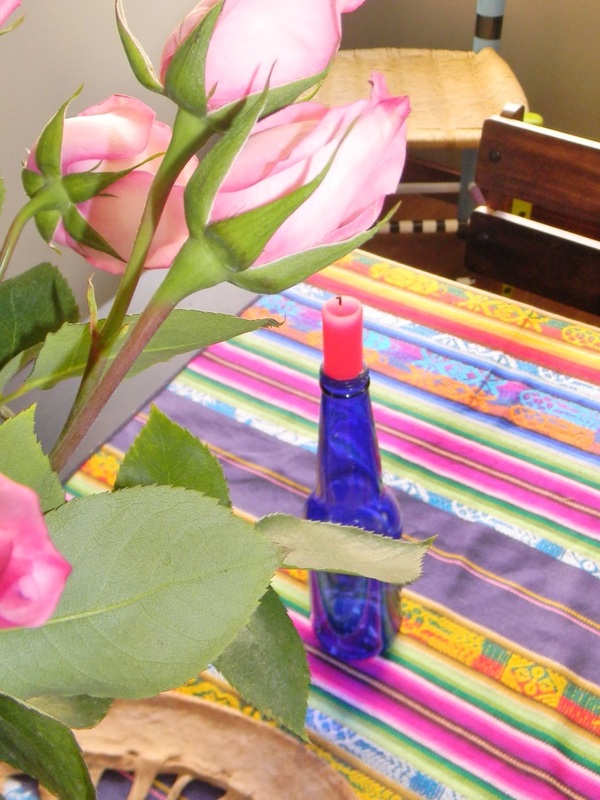 In fact it reminds me that last year with the grade 7 leavers dinner, the mom who was organizing it, got parents to send clear glass bottles and then she used different colour paint that she swirled around inside the bottles to make candle holders for the tables. At the time I was working at a glass factory and got her some nice clear bottles of different sizes. Thought it was a lovely and fairly cheap idea. WOW, I really LOVE the idea of swirling paint inside the bottles. How fun is that!?! Hope you are enjoying a great weekend, too, Gertie! Oh, Mun, I’m SO happy to hear from you!!! Glad you enjoyed all of our crazy ideas. You are too sweet. Hope you all are doing well! Thanks for stopping by!!!!!! I tried to decorate Casa Debbio as inexpensively as possible. I painted and stencilled the walls behind the beds, made brick and board bookshelves, used old tomato tins as decoration in the kitchen and framed my own photos for the walls. I also hand embroidered cheap white linen to make the curtains and tied them on with ribbons. I love some of your suggestions, you are very creative. Gosh, I love the description of what you did. And it sounds SO amazingly lovely, Debra. Thanks for your kind words, Debra, but YOU are creative, too! Seriously, I have NO idea how to embroider. I think you would like some of the decorating ideas at a B&B in Bagni di Lucca I have just written about on my other blog, Bella Bagni di Lucca. Oh, cool, I will take a look. I didn’t realize you had another blog. Can’t wait to see the B and B. Wish I was half this creative! So nice. Thanks, my friend. But you’re a writer! That’s creative!!!!! Great to hear from you today! You’ve got to be the most creative person I know Kathy! You never cease to amaze me! Oh, Nicole, you are too sweet, my friend. You’re pretty darn creative yourself! So excited that you get to go to Africa. Can’t wait to learn about that trip! Thanks, my friend. Thanks so much, Debbie. Yes, YOU of all people know what I’m talking about. You wok woman, you! LOL LOVED meeting you. Hope you all made it to Guayaquil okay. Oh, Kim, you are such a sweetie. I love your comments, as they are always SO encouraging. You rock, my friend. Thank you!!! Your creativity amazes me…what wonderful ideas! Thank you, Charlie. You’re a dear. Great to hear from you this evening. Thank so much, Diane. I’m delighted to hear you enjoyed this post and the idea of using ethnic clothing as art. I was pretty excited when the idea came to me. Hope you have a lovely weekend, my friend. Kathy, I am impressed and overwhelmed. 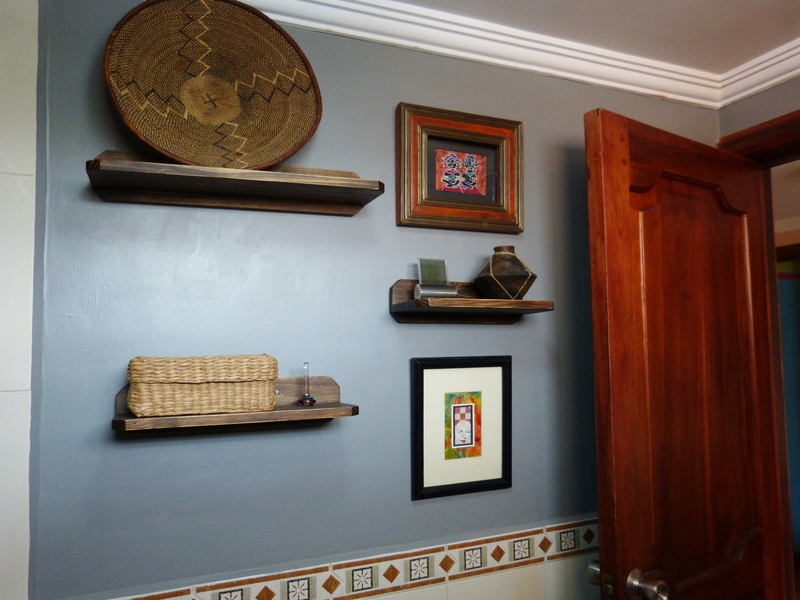 Leave it to you and Sara to happen to have a wall-hanging constructed from African spear handles lying around. Everywhere I look in my rathole I just see copies of the New Yorker and junk mail I’ve been meaning to toss in the recycle bin for a month. No doubt you guys could convert my detritus into an end table. Bravo. OMG–could I ever make you a cool New Yorker table! Wish I lived closer and I would do just that. Yes, I could do something with the junk mail, but the other would be really awesome. And leave it to you, dear V, to make an hilarious comment about those spears! Hope you have a great weekend, my friend. Fantastic! I love the concept of using what’s at hand. I particularly love the ladders and then the use of cans! I do use baskets for quite a few things, but I’m a bit utilitarian and somehow when you do it I see more flair. 🙂 The African spear headboard is simply brilliant! You do inspire me to look around and see what simple treasures I have been overlooking. 🙂 Really! Cans? And they’re beautiful! Thank you so much, Debra! Glad you like these ideas. I know the spears may be hard to come by for most folks, but the ladders aren’t that big of a deal to find and are EASY to convert. And the cans? A dime a dozen. Hope you will experiment with the latter, as you can do some fun things with them. Have a great weekend, my friend. Great to hear from you! Biggest failures? Way to many to name. I’m not a handy person around the house. You two are much more inventive than us. I love seeing your creations. And I love seeing you reuse things. We’ve started doing that. Not only is it great for the environment, but it puts a personal stamp on the place. Nicely done. Thank you, TB! Sorry it has taken me a few days to get to your comment. Personally, I’m a HUGE fan of your beer label project! Especially since the labels themselves are often works of art. Great to hear from you, my friend. Hope you all are enjoying a lovely spring weekend in London! Love this, Kathy. I’m in the process of mounting pretty drawer pulls on my wall. I’ll string a thin wire between them, then hang pictures mounted on tag board. I’ll post it once I’m done, but I’m waiting on my friend with a bolt cutter to trim the rods on the pulls. It takes a village. OH, Sandy, I SO TOTALLY LOVE this idea! I mean really?! This is brilliant. Can’t wait to see the results. Hope you are feeling a bit better. Sorry it has take me a couple of days to get to your comment. Great to hear from you! Gorgeous! Everything is so beautiful. I adore your place. Great ideas that even I could try here in serene, less colorful Boise. Thank you so much. I’m delighted you appreciate our ideas and enjoyed seeing our home. 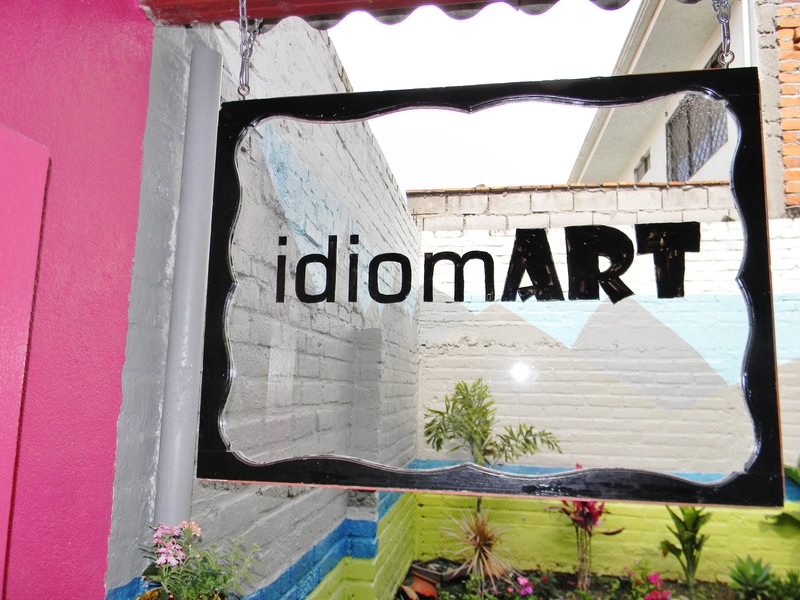 Hadn’t thought about Boise being less colorful, but then Ecuador is nothing if not COLORFUL! LOL Great to hear from you today, my friend! My friend, I’ll say its clear, when it comes to decorating and arts and crafts I’ve had a few failures… 😀 .However, one win was taking an old upright dresser of dearly departed Joe’s and turning it into an upright tool chest. 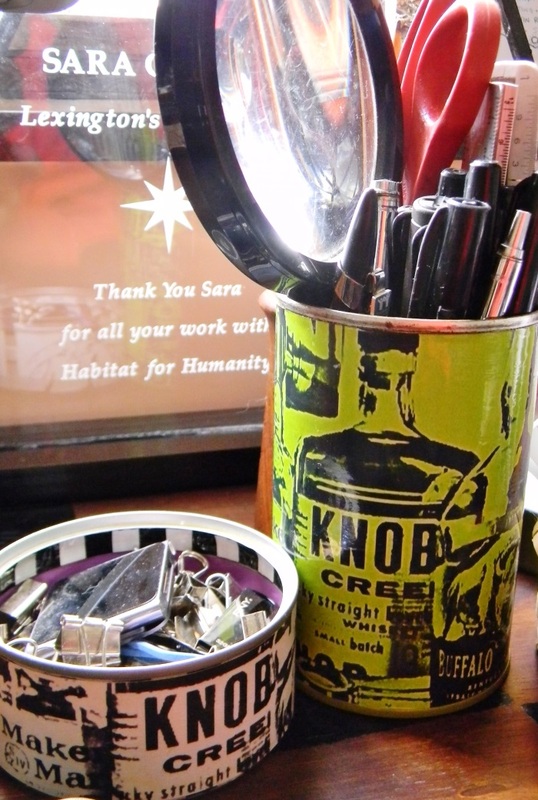 It has been great for keeping hammers, pliers, screw drivers and other bits and pieces organized. I’d like to saw we decorated the dresser beyond labels on the drawers but alas we did not. Maybe someday…..I love all your idea. Just Wonderful! Especially the box shelf! and cans. I feel inspired to inspire my teen. I’d imagine a dresser would be a great place to store tools, and I can understand why one might not decorate something that goes in the garage. LOVE the comment about feeling inspired to inspire Cole! LOL Go for it, my friend. He’s nothing if not handy! Great to hear from you today. Hope you all are having an awesome weekend. You and Sara are so creative with turning everyday objects into art and turning art into everyday objects. I love it all! But I was so intrigued with the plumbing materials used as curtain rods. As a matter of fact, I was just flipping through a women’s magazine someone left on our stoop and saw a feature piece showcasing all of the interesting things you can do with plumbing materials. You’re ahead of the trends as usual Kathy! Another suggestion they had was to use them as ledges for propping picture frames. Wow, I’m totally intrigued to hear about an article on using plumbing parts! Who knew? Seriously, they are really versatile, as they can be put together in lots of interesting ways. Plus, the copper can be cool, as the patina it gets is really lovely, at least in my mind. Glad you enjoyed the post, Jackie. Hope you and Reggie have a lovely weekend. Kathy, you should write a book with all your decorating ideas. If you lived here, I’d put you on TV, during our How-to lineup! So darn creative the things you can do with so little. Well done, my friend in Ecuador. I love the Ecuadorian influence on your art, btw. Thank you, Monica–especially for tweeting my post! You are always so supportive. God, I would LOVE to be on tv, so I’m sorry to live so darn far away. Hope the fires in the area aren’t affecting you too badly. How are things in your neighborhood? In the last fires I was evacuated and that was nerve-wracking. This time I was okay. They were using my local school as an evacuation center. But this is early for fire season. Way early, and we’ve got the whole summer ahead of us with nary a drop of rain. Scary thought. You’re making do real good over there. I suspect you’re showing off and whatnot ’cause I can’t decorate worth a darn. Thanks, my friend. You may not decorate so well, but you can sure make art! Hell, if I could paint and draw like you, I think I might give up writing all together. Hope you have a wonderful weekend, my friend! You both are such artists! I was in amazement reading and looking at the photos. The headboard, especially, was beyond inspiring. My decorating “look” is mainly Zen and simple, but sure do love the feelings that come from looking at decorating divas like you and Sara. Oh I really enjoyed this. 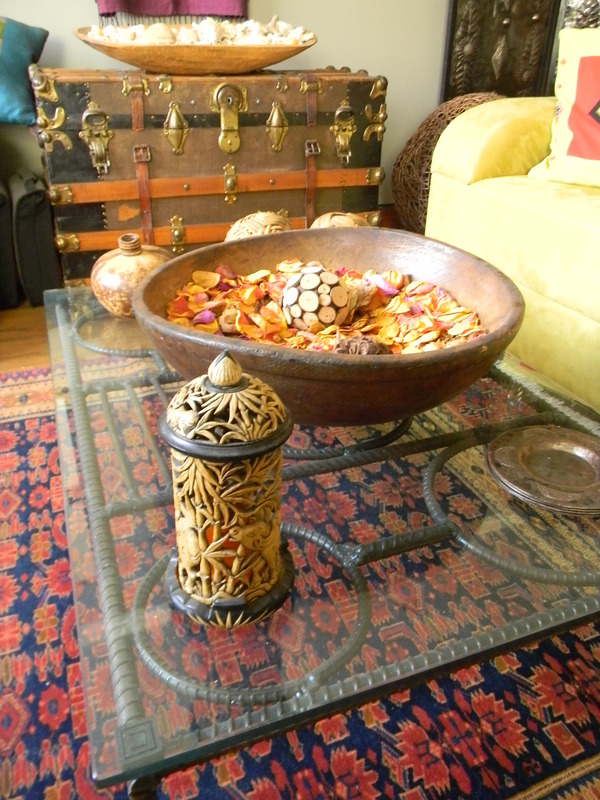 My favourite is the grill coffee table but even more it is the colours of your home that I love. It has the feeling of such a happy welcoming place. And that, right there, is an amazing talent and gift! Hello Cathy! You have exquisite taste, just simple flourishes like the candle and flowers are beautifully placed. I know you have intermittent internet just now so don’t worry about replying, I just stopped by to say howdy and enjoy your post, as always. You connect the writer to your world so effortlessly. There are some super interior decorating tips that I have picked up on this visit of your site, the cans as jars is cool. Especially pens because it will be perfect fit (mugs or vases don’t hold so many!). The hessian style rug I hadn’t thought of, always thought they may be very expensive as they appear in very stylish living rooms! Thanks for the bright ideas. The colors and textures are so inviting — can I just come over and sit a spell? 🙂 Loved all the ideas but I think my favorites are the spear headboard, the ladders above the bed and the cobalt blue beer bottle/candle holder == fabulous!